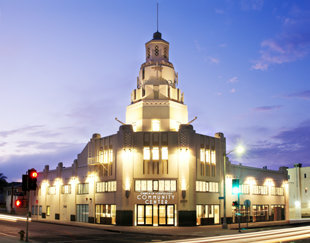 The new Church of Scientology of Inglewood was dedicated November 5, 2011, before 5,000 Scientologists and their guests. Mr. David Miscavige, Chairman of the Board Religious Technology Center and ecclesiastical leader of the Scientology religion, was joined by civic leaders and government officials to commemorate the opening of this Ideal Church of Scientology. The facility reflects the growth of a significant Scientology congregation within the area. On November 5, 2011, the Church of Scientology celebrated the grand opening of their new Church in the heart of downtown Inglewood at 315 South Market Street. 5,000 Scientologists were joined by guests and city officials for the dedication ceremony. Mr. David Miscavige, Chairman of the Board Religious Technology Center and ecclesiastical leader of the Scientology religion, dedicated the new Church of Scientology of Inglewood with, left to right: Executive Director of the gang intervention group 2nd Call, Skipp Townsend; NAACP Los Angeles Branch President Leon Jenkins; Inglewood City Councilmember Ralph Franklin; Inglewood Chief of Police Jacqueline Seabrooks and Rev. Cecil “Chip” Murray, retired head of the First A.M.E. Church in Los Angeles and now Professor of Religious Studies at USC. The new Community Center on Vermont Avenue is housed in an historic art deco landmark that dates from the early 1930s and which the Church has meticulously restored. It features a 380-seat event hall, the L. Ron Hubbard Community Auditorium, designed for community events and as a meeting ground for residents of all denominations. In that respect, it is a venue dedicated to community-wide initiatives in the spirit of the Founder’s vision of all church denominations working together to achieve the common dream of all religions. The Center further features numerous classrooms and seminar facilities for a full range of civic programs, including a complete literacy and tutoring center. Opening onto the Public Information Center and the entrance to the L. Ron Hubbard Community Auditorium, the Church of Scientology Community Center reception is the welcoming point for all who enter the Center. The iconic mural celebrates the rich cultural history of the area. The Church of Scientology Community Center features a 380-seat event hall, the L. Ron Hubbard Community Auditorium, designed for community events and as a meeting ground for residents of all denominations. The Public Information Center provides an incisive introduction to Dianetics and Scientology through hundreds of instructional films. Also presented here is the full range of Scientology civic programs, as well as the life and legacy of Scientology Founder L. Ron Hubbard. The Community Center’s atrium and lounge provides the ideal environment for civic leaders and visitors to meet and collaborate on outreach initiatives. The café is conveniently located just off the grand reception of the Church of Scientology Community Center. It provides snacks and refreshments to both parishioners and visitors. The Community Center lounge serves as a meeting ground for civic leaders and visitors to collaborate on humanitarian initiatives based on L. Ron Hubbard’s vision of all churches working together to achieve the common dream of all religions. This Seminar Room is devoted to Scientology Introductory services and a full range of civic programs. Among those services is the Personal Efficiency Course, providing fundamental Scientology principles applicable to every facet of life and work. L. Ron Hubbard developed the Purification Program to free individuals from the mental and spiritual devastation caused by drugs. The Purification Center features an iconic tile mural reflecting local history. This room is exclusively dedicated to delivering The Way To Happiness Course, based on the inspirational work by L. Ron Hubbard and comprising a common sense guide to better living. This room is exclusively dedicated to The Success Through Communication Course providing graduates with communication skills for everyday life. Here students study the Scientology Life Improvement Courses providing tools for the most vital and yet often troubling facets of everyday life. A tutoring center is specially designed for youth and adults to improve reading and writing skills with the help of L. Ron Hubbard’s groundbreaking Study Technology. A nursery is provided for the young children of parents attending Scientology services. now stands in the heart of downtown at 315 South Market Street. The facility reflects the growth of a significant Scientology congregation within the area. Church of Scientology of Inglewood’s reception extends a welcome to all who enter. Here, visitors will find an array of introductory books and Public Information Displays presenting the fundamental beliefs and practices of Dianetics and Scientology. Also presented here is an incisive view of Scientology Founder L. Ron Hubbard. The Church of Scientology of Inglewood Public Information Center presents hundreds of films introducing Dianetics and Scientology, the many Church-sponsored community betterment programs, as well as the life and legacy of Scientology Founder L. Ron Hubbard. The café is conveniently located just off the reception, providing a place for parishioners and visitors to enjoy refreshments. All congregational gatherings are convened in the new Church of Scientology of Inglewood Chapel—weddings, naming ceremonies and Sunday services. The Chapel both provides for its burgeoning congregation and serves as a venue for community events and functions. The L. Ron Hubbard legacy comprises tens of millions of published words, recorded lectures and films on the mind, life and spirit. These materials are available to parishioners and visitors. The bookstore offers materials in English and Spanish, while Mr. Hubbard’s beginning library is available in 50 languages. The Church of Scientology of Inglewood Seminar Room is devoted to Scientology Introductory services. Included in these services is the Personal Efficiency Course, providing fundamental Scientology principles applicable to everyday life and work. The new Church of Scientology of Inglewood’s Film Room for the presentation of Introductory Dianetics and Scientology instructional films. L. Ron Hubbard developed the Purification Program to free individuals from the mental and spiritual devastation caused by drugs. The Purification Center features an iconic painted-glass mural reflecting local history. The Community Center in South Los Angeles will also provide the Program. One of the many auditing rooms in the Church of Scientology of Inglewood. Each is ideally appointed to provide a distraction-free environment necessary to achieve spiritual enlightenment. 5,000 Scientologists, guests and city officials gathered Saturday November 5, for the dedication of an entirely new Church of Scientology and Church of Scientology Community Center. The Church stands in the heart of downtown, at 315 South Market Street, and reflects the growth of a new Scientology congregation amongst these communities. The neighboring Community Center stands just a few minutes away in South Los Angeles, at 8039 South Vermont Avenue. Together this Church and Community Center provide for all Scientology religious services as well as its many humanitarian initiatives and social betterment programs for the benefit of Inglewood and South Los Angeles. The new Inglewood Church of Scientology on South Market Street houses a Public Information Center presenting the beliefs and practices of the Scientology religion as well as the life and legacy of Scientology Founder L. Ron Hubbard. The Information Center further provides an overview of the many Church-sponsored humanitarian programs. These programs include a worldwide human rights initiative, an equally far-ranging drug education and prevention campaign, global networks of literacy and learning centers and the Scientology Volunteer Minister program now comprising the largest independent relief force on Earth. The Information Center’s multimedia displays include nearly 500 documentary films. The 28,000-square-foot Church of Scientology Community Center is located on the Vermont Avenue corridor in South Los Angeles. Originally built in the early 1930s the Church meticulously restored the historic art deco landmark. The new Community Center on Vermont Avenue is housed in an historic art deco landmark that dates from the early 1930s and, which the Church has meticulously restored. It features a 380-seat event hall, the L. Ron Hubbard Community Auditorium, designed for community events and as a meeting ground for residents of all denominations. In that respect, it is a venue dedicated to community-wide initiatives in the spirit of the Founder’s vision of all church denominations working together to achieve the common dream of all religions. The Center further features numerous classrooms and seminar facilities for a full range of civic programs, including a complete literacy and tutoring center. 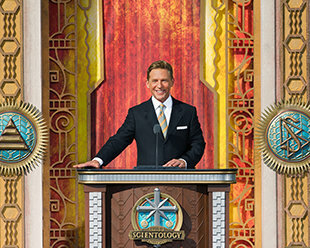 Marking the significance of this day, Mr. David Miscavige, Chairman of the Board Religious Technology Center and ecclesiastical leader of the Scientology religion, officiated at the ceremony. Welcoming the new Church were Inglewood City Councilmember, Ralph Franklin; Inglewood Chief of Police, Jacqueline Seabrooks; President of NAACP Los Angeles, Leon Jenkins; Executive Director of the gang intervention group 2nd Call, Skipp Townsend; and Rev. Cecil “Chip” Murray, retired head of the First African Methodist Episcopal Church in Los Angeles and now Professor of Religious Studies at USC. Rev. Cecil “Chip” Murray, retired head of the First A.M.E. Church in Los Angeles and now Professor of Religious Studies at USC, expressed highest regard for Scientology Founder L. Ron Hubbard and the Church of Scientology: “My friends, this new Church is an opportunity to make change. I encourage you, the community, to take full advantage. L. Ron Hubbard was a genius of a man who could say, ‘Here’s the problem, here’s the solution, and here are the details of how you achieve that solution.’ Well here is a mansion that has been constructed by L. Ron Hubbard, an architect of the soul and a designer of dreams. Our challenge is to make use of what we have been given. I am so very thankful for what you bring us today. God bless you all."